I know I haven’t said much lately, but I am back and I have a lot to say. I got an itch to do some canning a few weekends ago. Looking back in my blog archives I unearthed an old post from almost three years ago when I discovered that I could use my Ikea pot with built in strainer to do some small scale canning. If you need some canning pointers, check it out. 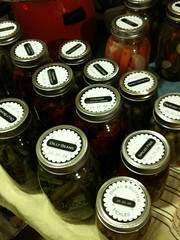 I went all out this time – I pulled the jumbo canning pot from the garage and kept going until I ran out of jars. I made: Dilly Beans, Dill Pickles, Bread & Butter Pickles, Caraway (Purple) Cauliflower, Spiced Figs, Dill Pickled Okra, Random Dilled Leftover Vegetables from the Fridge. – Ball Blue Book of Canning I think I bought this at the store at the same time I bought my canning pot, but I am not quite sure. It has fantastic recipes and very thorough instructions for the beginner. – Mustards, Pickles and Chutneys I got this at Half Priced books a long time ago. All of the measurements are metric, and I re-evaluate the acidity/preserving capability of each recipe because I think many of them were written for refrigerator storage. – Summer in a Jar: Making Pickles, Jams, and More.. Genius book that has single-jar recipes. The smallest batch possible! I don’t have a full review of this yet, but the method involves adding many more spices directly to the jar than I am accustomed to. I am used to simmer ing the spices with the vinegar, and only adding a small selection of spices to the jar. I wonder if these recipes will be dramatically different in flavor…. 1) Ace Pasttime Hardware, El Cerrito. Nice selection all year long. Ask an employee to show you where the canning supplies are, otherwise you could get lost in the maze of aisles. 2) The store formerly known as Big Longs (now converted to CVS). Tons of supplies all year, and open late! For your midnight jam sessions…. 3) Berkeley Bowl. They have some canning supplies tucked under the produce. Limited selection that was totally picked over and not replenished by the end of October. But it is handy to get your dill heads and jars at the same place. 2 Responses to "Filling up Jars"
Very productive – go you! Wow, I did not realize The Magical Longs (now CVS) had canning supplies! I\’m so sad, though–have you heard the rumor that they\’re moving/remodeling? I will be so sad if they turn into a regular CVS.